This resembles a car that you’d see on permanent display in some historic automotive museum, locked away, never to be seen in public again. But it’s for sale. It comes from the collection of John Moir, who had a car for every letter of the alphabet (just wait, we plan to feature many of them). Byron V. Covert & Company built cars in Lockport, New York, from 1902 through 1907. He built a steam car in 1902, but those from 1902 were gas – including this launch-year single-cylinder model that makes three horsepower. 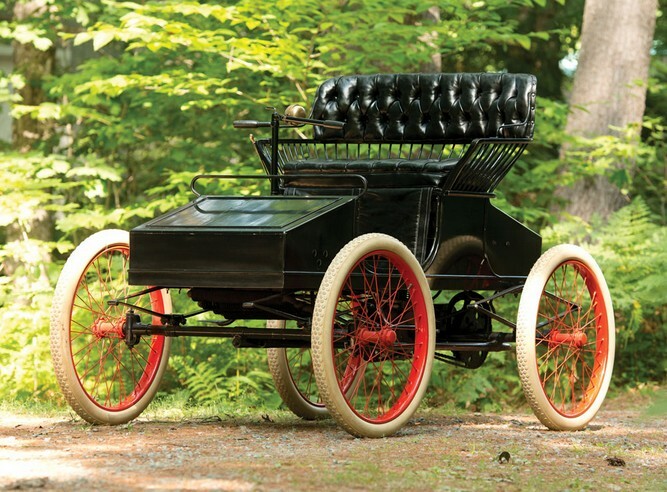 The Runabout was the only style offered for 1902. Covert changed his business in 1908, switching to manufacture of running gear parts instead of full cars. This is a very rare example of a little-known marque and it’s a wonderful example of early American motoring. It’ll cost you between $30,000-$50,000. You can read more here and see more from this sale here. This entry was posted in Uncategorized and tagged 1902, auctions, cars, classic cars, covert, rm auctions, runabout by classiccarweekly. Bookmark the permalink.